9th district, Ráday utca 43. City Hostel Pest is a mixture of a hostel and a budget hotel in the centre of Budapest. It is situated in the famous semi-pedestrian Ráday Street, which is in the middle of the entertainment zone. The street is full of cafés, bars and restaurants. Bakáts square with its beautiful church and famous %u201CNándori%u201D pastry shop and the Grand Boulevard are next door and the river Danube is also close by. Public transport connections are excellent. The tramline 4-6 on the Boulevard, tramline 2 along the river and metro line 2 (%u201Cblue line%u201D) are a few minutes away. Guarded parking possibility is provided opposite the hostel for extra cost. We offer 105 private rooms in a recently renovated 7-floor building (with elevators). Each two rooms have a common bathroom (with shower), and there are 30 rooms with own bathroom. The rooms are ideal for 1 up to 7 people, (group of 5-7 guests can receive apartments with 2 rooms). On each floor you have the possibility to use a well-equipped kitchen and a room for washing and ironing. The hostel has a community room with cable-TV and internet access. We run a 24-hour reception with tourist desk and luggage room. 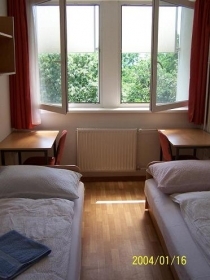 Our hostel is the best choice for backpackers, budget travellers and everybody for an overnight stay in Budapest. Come and enjoy the good location, cool atmosphere and the feeling of our beautiful city. We offer accommodation on an excellent location for good value.